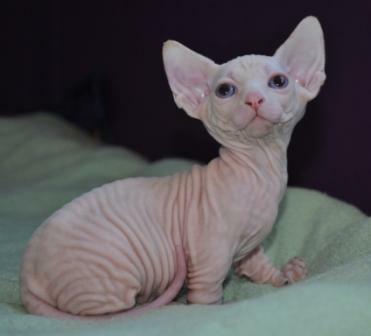 The Bambino Cat is a small-sized hairless breed, originating in the United States of America, developed by crossing the Sphynx and Munchkin. 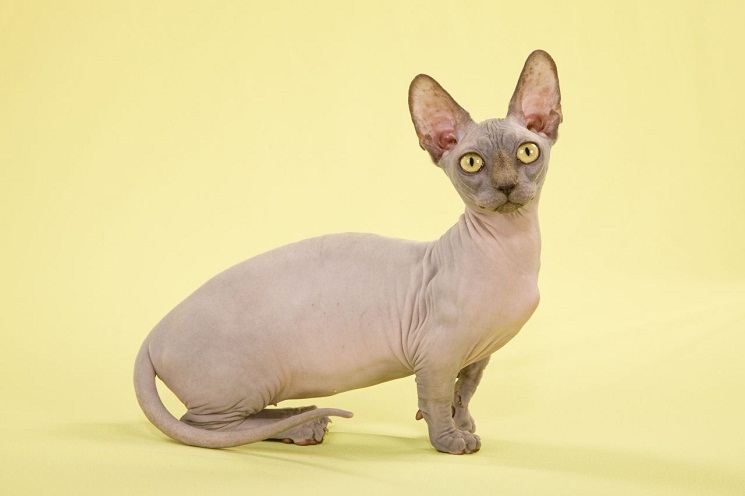 Inheriting the Munchkin’s short legs and large, upright ears, as well as the Sphinx’s hairlessness, these felines possess a charming and adorable disposition, forming excellent lap cats. 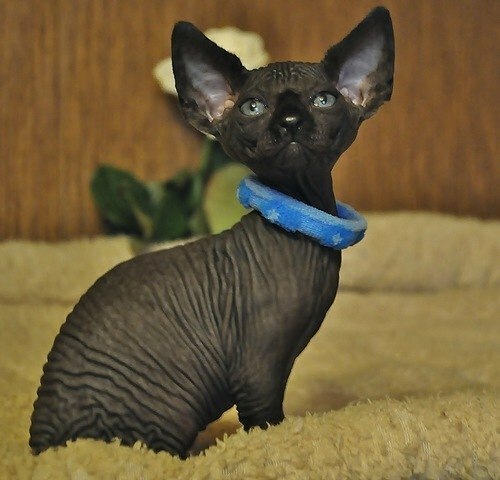 Though the short and hairless cats already existed for several years, the actual initiative for developing them into a distinct breed was taken by the breeder couple Pat and Stephanie Osborne belonging to the HolyMoly Cattery. 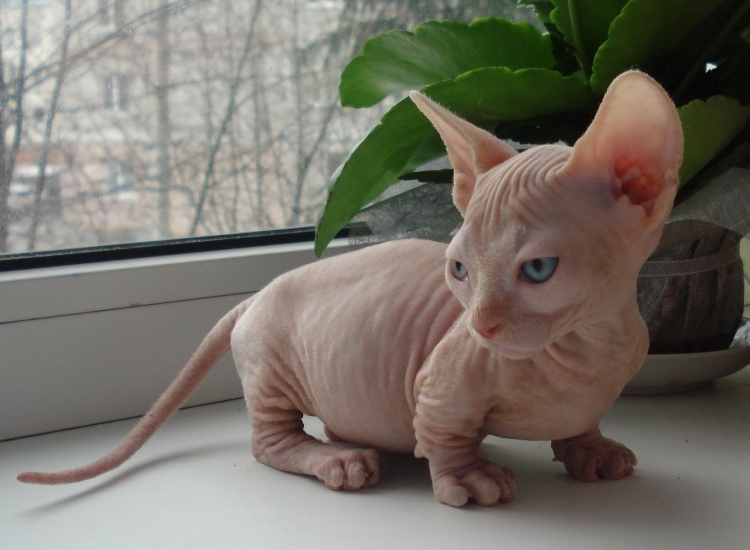 In fact, the couple was so impressed by the behavioral traits and appearance of the Munchkin-Sphynx mixes that they researched more on their health and other aspects, which thereby lead to the development of this breed. The name Bambino in Italian stood for “baby” and was probably given keeping in mind Pat’s Italian heritage as well as the kitten-like appearance of these cats. 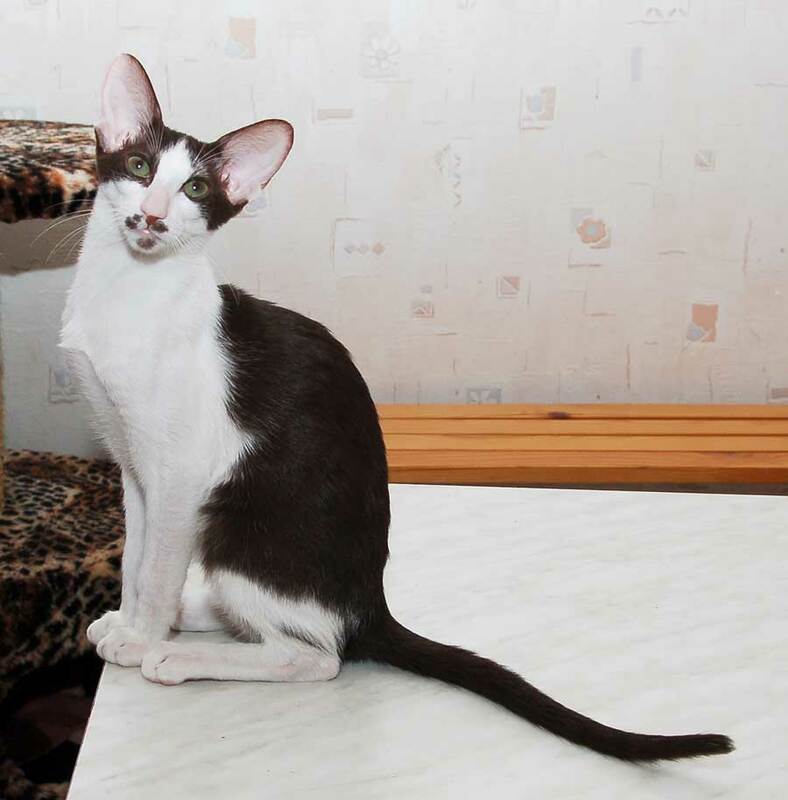 TICA (The International Cat Association) recognized this breed under the Experimental Breed Category in 2005. 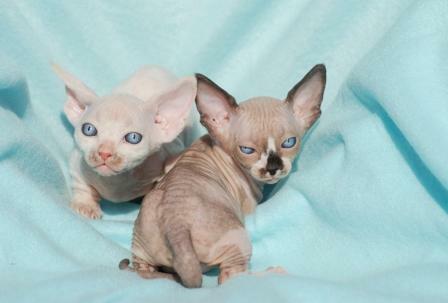 The REFR (Rare and Exotic Feline Registry) has also accepted registration for these cats. Considering the rarity of this breed along with the effort taken to develop them, they are highly expensive. In spite of their short legs they are agile enough, moving about energetically all over their household. Has a friendly nature, loving to mingle with people, also forming a deep bond with them. Enjoys being cuddled into the lap of their loved ones. Loves interacting with kids, emerging as their perfect playmate. Can quickly adjust to a new home or environment. Owing to its friendly nature, it is highly warm and cordial towards new visitors coming to your place. Can mingle freely with dogs, provided the canines are amicable with them. They would be a perfect option for people who wouldn’t mind spending too much to get an active, energetic, friendly, lap cat that is easy-to-manage, also needing less maintenance. 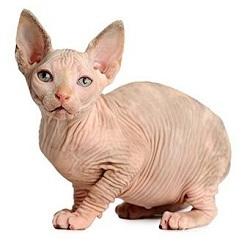 Though they shed highly less, the Bambino cats need to be bathed at least once in ten days using a baby shampoo to keep their skin free from sebaceous secretions. Make sure your pet is not exposed to excess heat as it might burn its bare skin. During the winter months make it wear a warm jacket during the cold months to help it be comfortable. 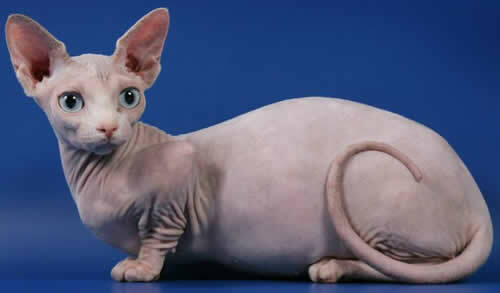 As the Bambino cat is a new breed more research is needed regarding any genetic health concerns that this breed may suffer. 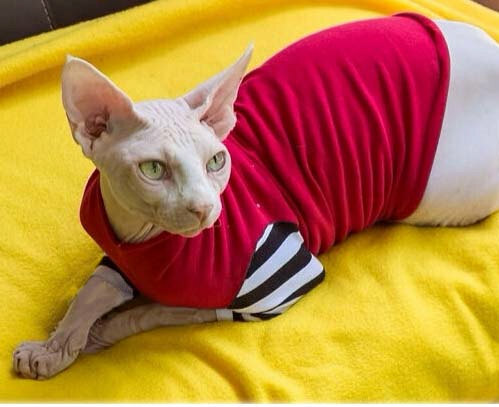 However, they might be prone to suffering HCM (Hypertrophic Cardiomyopathy), a genetic heart ailment often seen in the Sphynx cat. 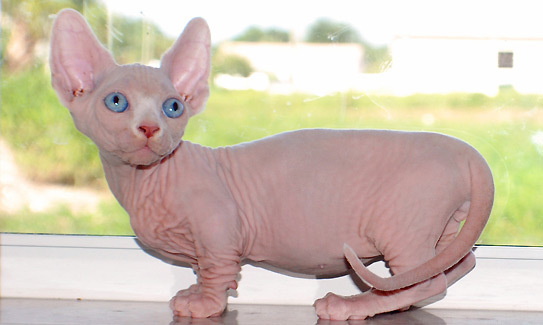 Other possible illnesses might be those related to the dwarf cats as well as yeast infections that hairless cats tend to acquire. Training these smart, intelligent cats would not be too mammoth a task as they would grasp your instructions well. Since yours is a playful and active cat, you can begin by teaching it to sit for a while. In fact, hold its treat over the head just behind its ears and move it in the direction of its tail to make it sit. Once he sits, say the command “sit,” and reward him. Doing this exercise regularly would help it master this exercise. The Bambino cat loves eating and has a healthy appetite because of its high metabolism. Feed it with good quality cat food and ensure it gets the required nutrients. Published on November 8th 2016 by Maxi Gold under USA Cats. Article was last reviewed on 26th May 2017.